Digital marketers all face a common struggle: managing the plethora of online touchpoints that their customers experience while they interact with a digital brand. As previously mentioned, one of marketers’ biggest struggles in the digital world is managing a large quantity of digital touchpoints, and moving customers along the buyer funnel efficiently. Most successful brands have a strong online presence that boasts a large amount of content with seemingly endless digital interactions. 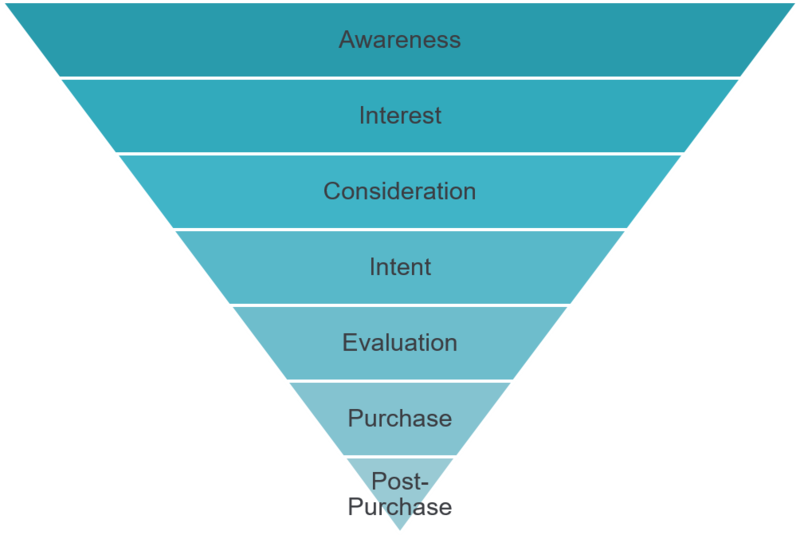 However, many AdWords strategies focus only on the top levels of the buyer funnel (Awareness and Interest) rather than the full customer journey (see purchase funnel below) merely scratching the surface of potential customers. How is a company supposed to manage all of this data, keep track of the thousands of daily site visitors, and align search engine marketing strategies to minimize the loss of potential prospects throughout the buyer funnel? This is where strictly defined audiences come to the rescue. Marketers can create audiences comprised of high-value users by leveraging tools such as Google Analytics and AdWords. These tools help analyze overwhelming volumes of data to create specific audiences for each stage of the buyer funnel. In this post we will discuss three methods for creating these audiences, using user-based segments, behavior driven personas, and smart lists. These audiences can be used for remarketing strategies, and are helpful to eliminate clicks from low-value users. This may seem a bit technical and vague, but don’t worry, a simple explanation is coming. Marketers can create user-based segments in Google Analytics based on the different actions a user has taken on their website as well as the different content that user has viewed. Audiences created from these segments are then immediately exported to linked AdWords accounts when Google Analytics remarketing is enabled. These audience lists can be used for targeted remarketing and remarketing lists for search ads (RLSA) campaigns. Marketers benefit by targeting audiences with known behaviors which are more likely to convert. While that seems simple, the process can become more complicated as users progress through the funnel. Suppose that a marketing team decides that a user is in the evaluation stage if they viewed an “About Us” page, a specific service page, completed a goal by requesting more information on that service offering, and then viewed content about the service pricing. Once the appropriate criteria are identified, a marketer can create a corresponding segment and import it as an audience to target those users through remarketing and RLSA campaigns. Creating segments for lower funnel audiences can be cumbersome, and the resulting audiences are not always as accurate as marketers would like them to be. However, the experts on the Seer Analytics team have developed a more effective audience alternative known as behavior driven personas. By using behavior driven personas the Analytics team at Seer can define these audiences based on phases of the buyer funnel with greater precision. To develop these personas a technique referred to as user scoring is implemented. A simplified explanation of this complex process is that users are assigned a numerical score based on the different content the user views, and the actions that the user takes on the website. This score continues to accumulate as the user interacts with the site. 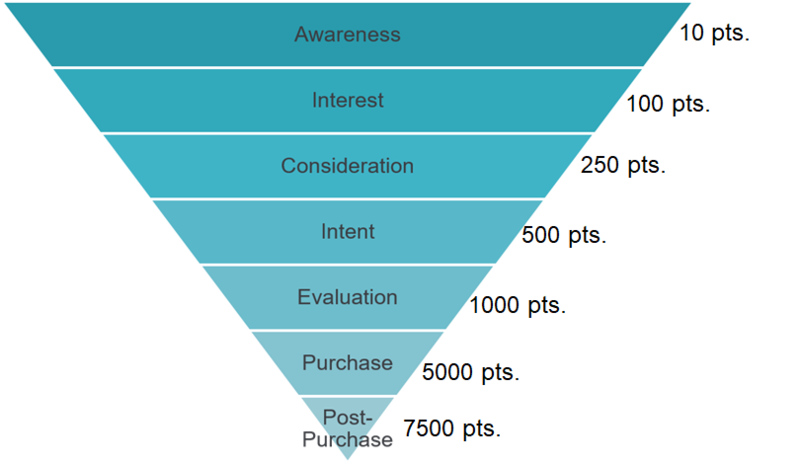 The numbers to the right of each phase of the buyer journey represent the associated user score for each phase. For example, a user who has landed on a page via a paid search ad, organic search result, or other digital channels for the first time, would receive a relatively low score and be bucketed in the Awareness audience. As users return to the site and view different types of content and take different actions, their user scores will increase based on the value assigned to each interaction. Therefore, as users progress through the buyer funnel, their scores will increase. This simplifies the audience targeting process. So, in this example, to target and remarket to users who are in the Consideration stage, simply create a segment that captures users with a user score ranging from 250 to 499. Different audience lists can be created for each phase of the funnel based on score, and this will help to automate the remarketing process while supplementing paid search strategies by guiding users through the buyer funnel. Using this audience targeting strategy allows marketers to target higher value users with greater precision and confidence. Therefore, the size of the group that views and clicks these ads will be smaller, but each user in the group will be significantly more likely to convert on the site. The end result is a decrease in cost per acquisition and an increase in conversion rates. 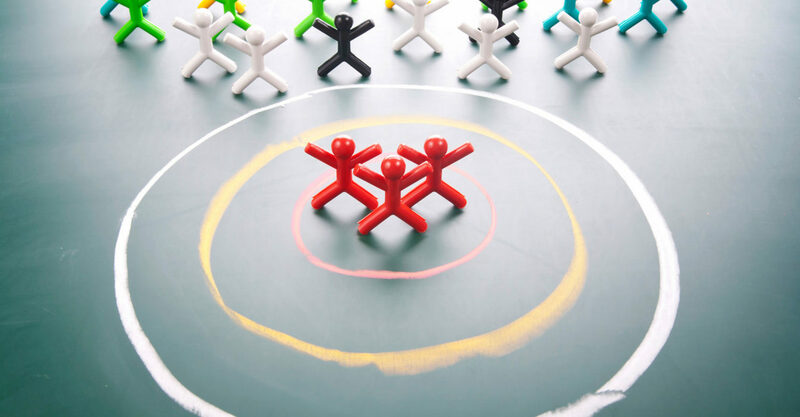 While creating audiences using behavior driven personas is certainly one of the most effective methods for audience targeting along the buyer funnel, it is not appropriate for all types of businesses. For example, a business to consumer (B2C) e-commerce site may have a short buyer funnel, some even begin and end in the same phase. Therefore behavior driven personas wouldn’t provide as much value. However, Google Analytics has a feature labeled Smart Lists that will help to address the audience targeting needs of businesses like a short-funneled e-commerce site. Smart Lists are easy to create. 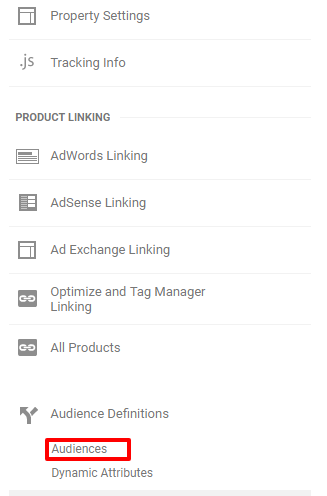 Now the Smart List will automatically be added to the connected AdWords account’s remarketing lists. But what are Smart Lists? 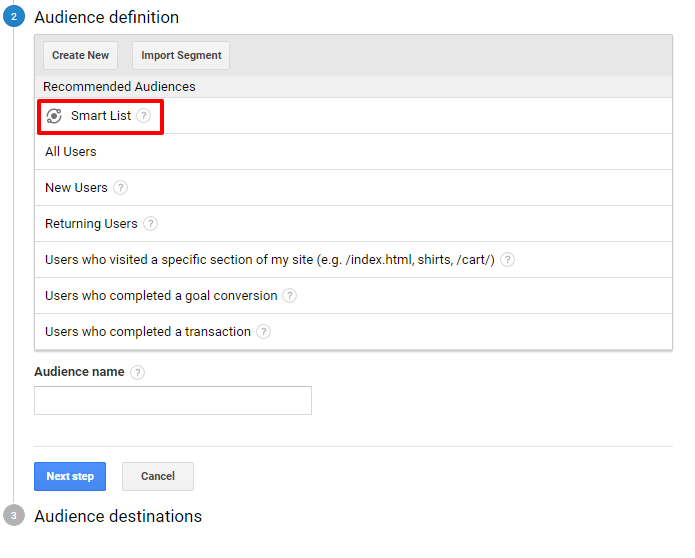 Google Analytics creates Smart Lists by analyzing all available user data and creating an audience of the top 10% of users that are most likely to convert on the site. The list is automatically updated as the qualifying metrics change. Using Smart Lists is a simple way to automate effective audience targeting throughout remarketing campaigns. However, one major caveat to using smart lists is that the site needs 10,000 daily pageviews, and 500 monthly e-commerce transactions in order for Google Analytics to have enough data to create an accurate list. So What… Why is Audience Targeting so Useful? Audience targeting is useful because it helps to provide marketers with a contextual perspective of consumers. In order for digital companies to maximize their bottom line they need to be cognizant of their customers’ comprehensive digital experiences with their brands. Gone are the days when customers could be analyzed as a singular keyword, click, or conversion. Today, they are viewed as audience members that have specific attributes, needs, and intentions. Digital marketers can upgrade their practices to reflect this change in perspective, which can be done by creating audiences using any of the above strategies. These fresh audiences can then be used for highly-targeted remarketing and RLSA campaigns. This practice helps to create a seamless brand experience across all digital touchpoints. Ultimately, these efforts will result in increased conversion rates, reduced acquisition costs, and increased customer lifetime values. Use relevant ad copy and creative to appeal to the targeted user in their specific stage of the buyer funnel. Acknowledge that the user has been to the site before by providing an enticing Call to Action (CTA) regarding next steps in the process. Use relevant landing pages that create and deliver a seamless experience across the buyer funnel. Landing pages should all be optimized to contain specific content and offerings that are relevant to the user at that particular stage in his/her buyer journey. Implement realistic remarketing timelines. Don’t rush a user through the remarketing process by targeting them before he/she is ready to move to the next step. On the other hand, don’t lose a potential customer by forgetting to remarket to him/her within his/her window of interest and intent. Follow up with customers after they complete a final purchase. It is cheaper, and easier, to retain an existing customer, than it is to acquire a new one. This stage in the buyer funnel is often neglected and with it a significant revenue opportunity. If you want to learn more helpful hints and better target your audience, sign up for the Seer Newsletter through the form below!